Photo Courtesy of : Papillon 911 Rescue and Adoption, Inc.
Also called the Continental Toy Spaniel. The Papillon is one of the oldest breeds of dog, with a recorded history in Europe going back nearly 700 years. The breed originally only had dropped ears and was called the "epagneul nain" or "dwarf spaniel." Much of the breed's development is known because of its depiction in paintings. This tiny breed is recognizable in 13th through 15th century Italian paintings in the Renaissance period. They were often painted on the laps of French and Spanish noblewomen. The dog was later known as the Continental Toy Spaniel, which is the official name the FCI standard goes by. They were sometimes referred to as simply a Toy Spaniel. Over time, an erect-eared type, fringed as to resemble the ears of a butterfly, developed. Papillon means "butterfly" in French. •	Papillons have long been known as the "Butterfly Dog" because of their butterfly wing-like ears. •	Great lap dog, not a 'high energy' breed – makes for an easy lap dog. •	Papillons are known for their great temperament which includes being steady and obedient. •	Friendly, Intelligent and tougher than they look. •	Playful, lively, amusing, animated and charming. •	Affectionate, gentle, patient and proud. •	Love to cuddle and enjoy outdoor romps. •	Some are yappers, most aren’t. •	Not a good breed to be left alone for long periods of time. Can suffer from separation anxiety. •	Need daily exercise through play or a nice walk. •	Good city dogs, but not always the best apartment dog, because of their protective instincts: they tend to bark easily at unknown sounds, be they casual or alarming. •	Can be prone to kneecap problems in the hind legs. •	Can have a difficult time under anesthesia. The Papillon is the number one dog in dog shows, excelling in obedience or agility sports, which should say a lot about the personality of this courageous little dog. An entertaining sort of dog, they are considered to be a hardy yet dainty little dog with a long life line, they are very devoted to their owners along with being a very high-spirited dog with a happy and livelily personality. One would think they are the classical lap dog, and that this little "butterfly" of a dog would seem to be the type of pretty little dog that is content to sit on its owner's lap and idly watch the world around them drift by. Not so. On the contrary, as small as it is--the Papillon loves to hunt and flush out butterflies, moths, and mice--little things within its size range! But it cannot be used in field trials as it is too fine-boned and dainty, even though that is where the Papillon's little heart is. The basic field trials, usually involving the stronger and more durable hunting dogs like the hounds, spaniels, Labrador, retrievers, etc., involves participating in a sport that definitely would do damage to this little dog that has more courage than having some old-fashioned common sense. So it has to "make do" with being a small little watch dog, setting off the alarm whenever a bird flies over-or-a mouse quickly scuttles across the field before the brave little canine hunter finds it. Grooming a Papillon is not like grooming most other dogs. The Papillon tri's, black and whites, and deep sables require a shampoo that is clear, blue, or white shampoos only--some purples are out there, but it is wise to use it before ever showing the Papillon or taking the little dog over to Grandma's Sunday dinner with the entire family waiting to see the new little dog. The other shampoos will eventually yellow the coat. Rinsing is extremely important as a slightly "bluish or purplish" tinge has been known to remain in the dog's coat if not rinsed well. Many dog breeders use human shampoos for Platinum Blondes or for silver hair successfully, or there are dog shampoos similar in style. The whitening shampoos, if used, do not drain any color off the tri's, black hair, or deep sables. Good dog shampoos never "leach" the color when used, so make sure they work--especially on the red color. Whitening shampoos used on the red hair will wash out the red color of the hair with prolonged use. A good Papillon never requires a cream rinse as their hair is so silky. BUT, for those who do have Papillons with red or sable colors, a slight bit of the cream rinse never hurts as their hair tends to be a bit drier than the other colors, explaining why red Papillons grow less fringe. Cream rinse used on other colors may have a tendency to look oily and stringy, according to professional dog groomers. But do pay special attention to the ear areas, using a de-greasing detergent in that area if needed due to an "oily" look and feel. Drying the hair of a Papillon depends on the type of hair. To dry more quickly, the hair can be blown against the grain if the dog has perfect Pap hair. Otherwise, blow it with the grain, drying the whole body not just here and there. When brushing the Papillon, never use a slicker brush as it will break the silky hair, while leaving split ends. That particular brush should be used on Pomeranians and Poodles. Use a comb, but never use it on the wet hair of a Papillon--and use it properly. This is not a tool to be used with lack of experience. As small as the Papillon is, they still need an average amount of exercise, due to their high-energy nature. They are low on the level of exercise, but need to still be exercised enough to keep them calm when inside or not exercising. 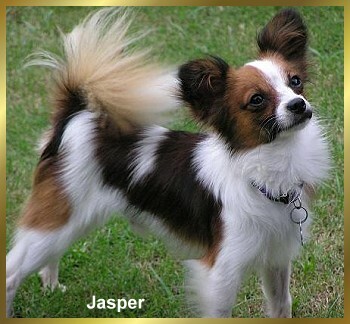 The Papillon is highly intelligent and easily trainable, due to a strong love of their owner and a desire to please. Highly affectionate, this adds to the ease of the training routine for the breed. All breeds were developed for some purpose or another, and the Papillon was raised to be a companion to people--inseparable and within close proximities at all time. A Papillon will never make it with an owner who has little time for the dog, requiring only a moderately demanding companion. They thrive on stimulation, obedience work, agility trials, dog therapy, trick performance, and anything that allows them to use their intelligence and still be close to their human owners--particularly the males as the females have a tendency to be slightly "aloof." Many novice trainers confuse a dog's intelligence level and their ability to be trained. A trainer who is very inconsistent will not achieve consistent results, even teaching basic command teaching. The Papillon has the highest aptitude for learning, and has the ability to learn from everything around them--one experience after another--without any particular form of training. Forced training does badly with this breed, due to their high response rate for positive reinforcements.